It seems like June was just yesterday, but now we are at the end of August. It’s simply amazing how fast the Summer months go by. The end of August means the end of another successful National Eye Exam month. Although National Eye exam month is quickly coming to an end, it doesn’t mean we are done raising awareness of the prevalence of eye diseases and how to prevent our elderly loved ones from suffering from them. Throughout the month of August, the Wiser Home Care Services blog has covered two of the four leading eye diseases amongst the elderly. As we continue our series this week, we will scour through the causes, treatment and prevention of Diabetic Retinopathy. 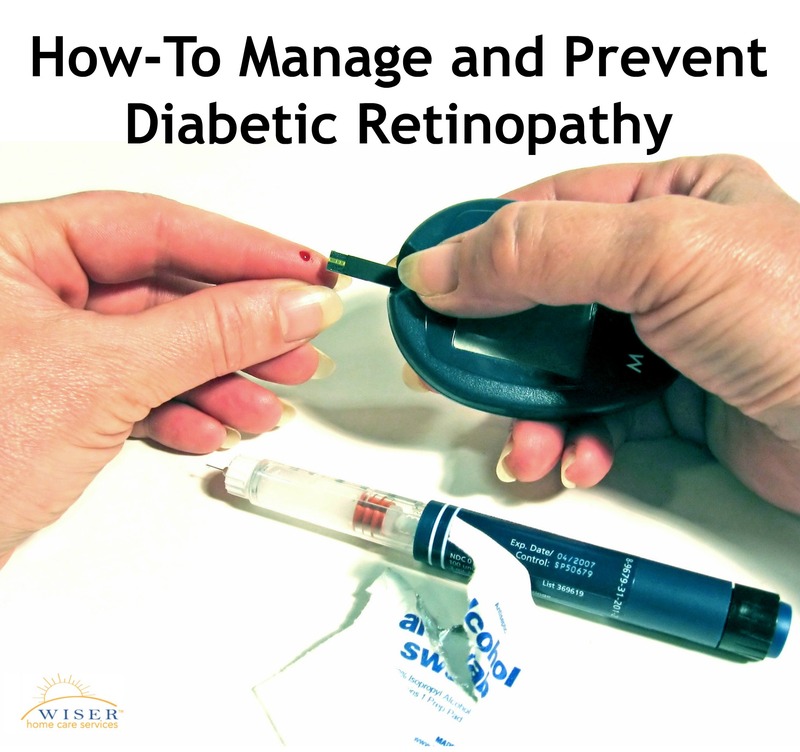 Diabetic Retinopathy(DR), a diabetic complication that affects eyes, is caused by chronically high blood sugar levels that, with time, damages the blood vessels of the light-sensitive tissue at the back of the eye. The disease can cause blood vessels in the eye to leak blood and blur vision. According to a study conducted from 1990-2010, Diabetic Retinopathy was the leading cause of vision loss in adults aged 20-74 years old. Furthermore, the study found that diabetic retinopathy is the fifth most common cause of preventable blindness in the world. In 2010, by the end of the 20-year study, there was an estimated 285 million people worldwide with diabetes and over 1/3 of these people had signs of developing Diabetic Retinopathy. Diabetic Retinopathy only effects people who suffer from diabetes (Type 1, 2 and gestational), and the longer someone has diabetes the higher their risk of suffering from it are. In addition, high blood pressure, cholesterol and tobacco use will increase the risk of suffering from DR.
Once you have DR, treatment for the disease is focused on slowing and stopping the progression of the disease rather than reversing its effects. In the early stages of the disease, the doctor will simply ask the sufferer to maintain healthy blood sugar levels in an effort to slow the progression of the disease. Focal Laser Treatment- Slows or stops the leaking of blood and fluid in the eye. Scatter Laser Treatment- Shrinks the abnormal blood vessels in an effort to stop vision impairment. Vitrectomy- The surgeon will make a tiny incision in the eye to remove blood from the middle of the eye. These methods slow or stop the progression of the disease. However, the victim will likely still suffer from some form of vision loss. Unfortunately, since diabetes is a life-long disease, they will remain at risk of developing DR again. If you care for an elderly loved one who suffers from Diabetic Retinopathy, and would like help caring for or developing an extensive care plan, we can help. We will be happy to answer any questions you may have.